The Irish in New Haven have a rich history in the military mostly beginning with the Civil War. By that time there was a large, established Irish population in the city and many had become naturalized by the start of the war. The Irish residents of New Haven were happy to volunteer to help their new homeland. Recently I discovered another military group, The Washington-Erina Guards, that was founded in New Haven over ten years before the Civil War broke out. As it turns out, one of the founding members, James Bannon (Banning) was my ancestor. Other names listed as founding members, Thomas Preston and the Shields brothers, were James’ brother in law and a brother in law’s siblings. On July 31, 1849, a meeting of those interested in a projected Irish company was held in the Glebe building, corner of Church and Chapel streets, New Haven. Capt. James Quinn was chairman of the meeting, and John Duffy, secretary. The organization was named the Washington-Erina Guards. Provision was made for drilling the men and the company made good progress. After drills had been in progress some time, Col. John Arnold, of the Second Regiment, requested the members of the company to petition Governor Trumbull for a charter and to have the organization taken into the service of the State as part of Col. Arnold’s regiment, as there was a vacancy for a company in the latter. In accordance with Col. Arnold’s request, a petition to Governor Trumbull was drafted Feb. 8, 1850, and was signed by John Duffy, Thomas Newman, James Gallagher, William Geary, Francis McBryan, John Maher, Barney Galligan, Patrick Maher, James Brady, Patrick W. Kennefick, Daniel Crowley, James Banning, Michael Shields, Stephen Flynn, Geoffrey Ahearn, Rendles (Spelled elsewhere as Randal and Randall Shields) Sheilds, Edward Hamel, Thomas W. Cahill, Thomas Preston and John L. Duffy. This petition, however, was never forwarded to Governor Trumbull, as it was thought the incoming governor (Seymour) would be more likely to grant the desired recognition. Governor Seymour did so in March, 1852, the organization becoming officially known as Company E, of the Second Regiment. The officers commissioned were to take rank from March 17,that year, and comprised : Captain, John Duffy ; First Lieutenant, Thomas W. Cahill ; Second Lieutenant, Randal Shields; Third Lieutenant, Peter Hanley. 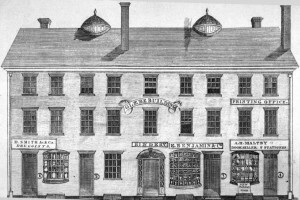 The company established an armory at the corner of Water and Fleet streets, New Haven, purchased its own uniforms, and received flint-lock muskets from the State. These muskets it continued to use until an order came in August, 1854, from John C. Hollister, then AdjutantGeneral of the State, requesting the company to return the muskets to the arsenal, in Hartford, and stating that the command would be supplied with percussion-lock muskets instead. The old muskets were thereupon returned and the new ones received. one year, and was hospitably entertained by the people of that city. The company became very popular through cut the State, and received many compliments on its drill and general soldierly bearing. The organization of the Washington-Erina Guards took place, as has been stated, on July 31, 1849. 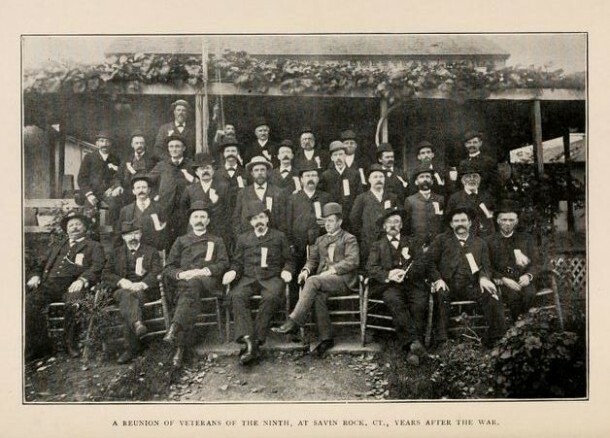 Of the original members, the following were still living, Aug. 8, 1899, fifty years after: William Geary, Peter Sheridan, Thomas Preston, Michael McCarten, James Daly, Patrick Maher, John Cummisky, Thomas Layden, Michael Hughson, John Conlin, Jeremiah Donovan, James Wrinn, Daniel Carroll, Michael Gilhuly, Timothy Fogarty, Patrick Garvey, and Daniel J. Crowley, — seventeen in all. John Cummisky, one of these survivors, died in Chicago, 111., Jan. 8, 1900. We’ll have more to come on the Irish from New Haven in the Civil War. Please feel free to contact me if you have any information or resources to add! This website is intended to provide a history of the Ninth (1861-1865) as well as some soldier’s stories, information on the makeup of the Ninth, a listing of known gravesites, a description of regimental flags and various newspaper histories. In addition a review is provided of the Ninth’s monument dedicated in New Haven in 1903 and the Connecticut monument honoring the Ninth Regiment dedicated at the Vicksburg National Military Park in October of 2008. The 13th Connecticut Infantry Regiment lost 2 officers and 42 enlisted men killed or mortally wounded and 3 officers and 157 enlisted men to disease during the Civil War. The regiment is honored by a monument in the National Cemetery in Winchester, Virginia. *Note: One of my relatives, Bernard Stanford” was was a Private in Co. K of the Connecticut 13th Regiment Infantry. He enlisted on 25 Dec 1861 when he was only 17. His enlisted record lists him as being 21. He re-enlisted for 3 years on Feb 8 1864 along with 400 members of his company. “The American Civil War Research Database” lists him as “deserting” 27 Aug 1864., however “Record of Service of Men during War of Rebellion” says he was “mustered out” on that same date. His unit spent much of their time in Louisiana and Mississippi. They were camped at the junction of the Mississsippi and Red Rivers from May to July 2, 1864. Bernard is listed as being wounded on June 19 1864, which would mean it was while camped in this location. On July 27 1864, his unit began a month long furlough in New Haven. It seems that his “desertion” date means that he did not show up on the day that they shipped back out. 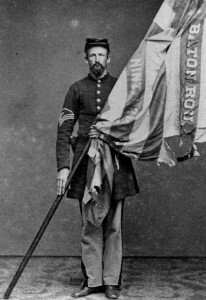 * My relative, James Stanford, of New Haven, was a member Co. M. of the 1st Conn Heavy Artillery in 1862-65. He enlisted 20 Jan 1862. He re-inlisted on Feb 5, 1864 and was mustered out on Sept 25 1865.